﻿ Stretching, is it necessary? Despite the years of research and mountains of data, there still is no definitive answer to whether stretching is worth your time and effort. Proponents argue that stretching prevents injury, diminishes delayed onset muscle soreness and improves athletic performance. Some go as far as to say that regular stretching can help speed recovery from workouts and improve blood flow to the area being stretched. Opponents will argue that stretching can actually cause injury, and does nothing to improve performance or prevent delayed onset muscle soreness. In fact there are many experts who not only believe stretching does nothing to improve performance, but that it can significantly hinder it. Each side can site numerous studies to support their claims. Why should you, and when? Because there is so much conflicting data, should we even bother stretching? The answer is a resounding "yes". Our bodies are a feat of engineering that man, in all his wisdom and brilliance, cannot replicate. For example, as we grow and develop into adults, we are provided with a certain degree of flexibility governed by our genetics. This flexibility allows us to have a normal range of movement around a joint. This range of movement is crucial to the health of our joints. Training, injuries and the natural aging process all will diminish flexibility and the range of movement we started with. Flexibility is not only lost or gained in the muscle, it's also determined by tendons, ligaments and other connective tissue. It is this relationship between bones, muscles, tendons, ligaments, etc., that took millions of years to perfect through evolution. Any disturbance between the structures in our joints can lead to hindered performance or serious injury. Maintaining joint integrity is the key to avoiding injury. As the muscle loses flexibility it begins to weaken. As a muscle weakens it tends to tighten. This condition is called the "weak and tight factor." This is by far the number one reason for stretching. When flexibility is lost, a joint becomes tighter. The two bones that form the joint are drawn closer together. This effect causes an impingement of the connective tissue within the joint. Any orthopedic surgeon will tell you a loss of flexibility at the joint can inevitably lead to a whole host of problems. These problems can range from simple muscle spasms, to nerve damage. Most of the injuries occurring from a lack of flexibility are a result of cumulative injury disorder (CID). CID is an injury that occurs over a period of time and is a direct result of repetitive motion. For instance, somebody who develops tight hamstrings will usually be unaware of any problem at the onset. However, tight hamstrings will force the pelvis to tilt, resulting in an unnatural lordotic curve (the arch in your lower back). Consistent repetition in this position while weight training, running, walking, standing, and even sitting will eventually lead to injury in the lower back and knees. The second reason I advise stretching is to allow you to perform at your best. No, I don't believe that stretching will actually help you perform better - there is just too much conflicting data to support this claim. However, if you do not stretch, and in turn lose flexibility, it will hinder your ability to train with a full range of motion. For instance, if you squat during your leg routine and your hip flexors are tight, this condition will prevent you from performing the exercise correctly. Tight hip flexors will not only keep you from squatting with a full range of motion, they may also force your knees forward during the eccentric phase (lowering), which can lead to problems in the knees. Loosening the hip flexors will allow you to obtain proper joint angles while performing the squat and provide a greater training stimulus. You can see from just this one example how important training with proper flexibility is. Yet the controversy continues. No matter which side you take, and no matter what the reason, the data is conclusive on one point: It's much more effective to stretch muscles that are already warmed up. A warm-up is light to moderate activity lasting 10 - 15 minutes before the actual workout begins. Warming up drives blood into the muscles and synovial fluid into the joints, thus reducing stiffness. If you warm-up first, you'll make much more progress than if you stretch cold. Stretching after your warm-up is more productive than stretching cold, but what does it do to your workouts? Stretching before your workout has been shown in several recent studies to hinder performance. So, if stretching is done before the workout, make sure it is very light. Do not, and I repeat, do not do any type of deep stretching directly before your workout. Many athletes including, bodybuilders, powerlifters, sprinters, etc., will tell you they perform much better when their deep stretching is done after the workout. The bulk of your stretching should be used as the cool down phase of your workout. Stretching after your workout elicits a much greater response than at any other time. This is primarily due to the inverse stretch reflex. After a strong contraction of a targeted muscle as with weight training, there is a period during which the targeted muscle relaxes. This increases the muscles' ability to lengthen or stretch. The inverse stretch reflex allows you to attain a much greater movement around a joint. As stated earlier, joint integrity is the number one reason you should stretch. Keeping a normal range of motion at the joint is imperative in reducing the risk of injury and insuring a proper training stimulus. For instance, as stated earlier, shortened hamstrings can contribute to lower back pain and knee pain. As far as performance is concerned, tight hamstrings can inhibit your ability to train, run or even walk correctly. Unfortunately, this type of situation can go unnoticed literally for years and not get treated until there is an injury. 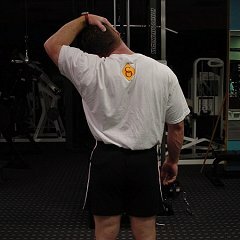 So what is considered normal range of motion? Below is a list of tests you should perform periodically to evaluate whether you are developing a restriction around a joint. This is not a complete list, but it takes care of the major areas of concern. Fig. 1.1	Hip flexion with the knee straight is ideal at 90 degrees. 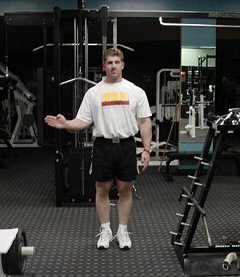 Fig 1.2	Normal range of hip flexion (knee bent) (a), is 120 degrees. 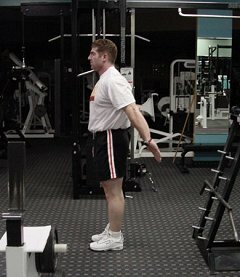 30 degrees for hip extension (b). Fig 1.3	Normal range of hip abduction is 45 - 50 degrees from the midline of the body. There are several types of stretches. Just as there are arguments for and against stretching, you shouldn't be surprised that there are also arguments for and against specific types of stretching. Over the last twenty years, different types of stretches have come in and out of favor. Because of this constant cycling of styles, I suggest sticking with the basics. Static stretching, which was popularized back in the early eighties, is the type of stretching I tend to favor especially if done without someone to assist you, which is the way most people stretch. The following is a list of stretches that should take roughly 15 minutes to do. You'll notice that I have listed the exercises in a specific order. There is a method to this madness. Every stretch prepares the subsequent stretch. For instance, we start by stretching the neck, which begins to loosen the upper traps, which tie into the shoulders. 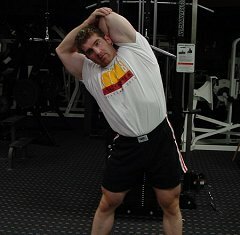 Stretching the shoulders next will allow you to better stretch the chest and upper back. And so on. When you stretch a specific muscle, it is important that you focus on that muscle. When you begin to stretch, lengthen the muscle slowly. Reach a comfortable position, then hold for 10 - 30 seconds. Concentrate on relaxing the stretched muscle. The longer the position is held the more the feeling of stretch diminishes. When the feeling starts to diminish, move slowly into a deeper stretch and hold again. Do this twice for each stretch. 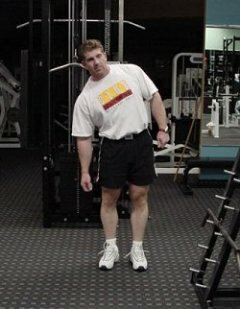 Neck: Stand and let one arm hang at your side. Lean your neck in the opposite direction. Using the arm that your head is leaning towards, gently pull your head further. 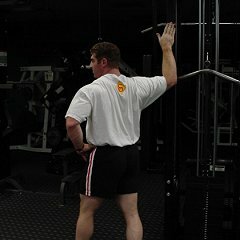 You should be moving your ear toward the top of your shoulder. 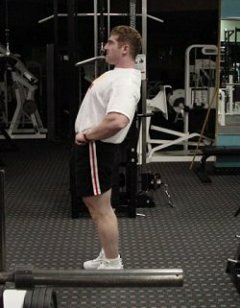 You can also use this variation: Gently pull your chin toward your upper pec. Upper back and shoulder: Flex your arm at 90 degrees and bring it in front of your chest. With your other arm gently pull, holding at the elbow. 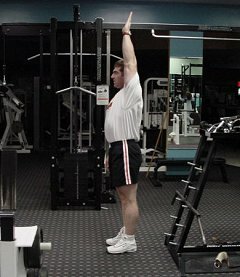 Chest: Flex your arm at 90 degrees, and bring your upper arm parallel to the ground. 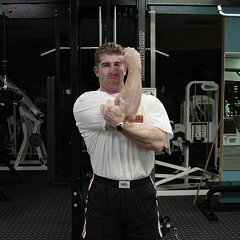 Put your forearm against a solid piece of equipment. Slowly rotate your body away from the equipment. 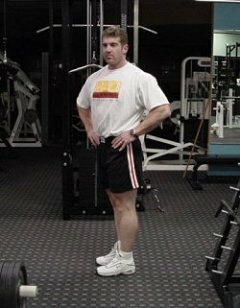 Lats and triceps: Stand with your feet slightly wider than shoulder width. 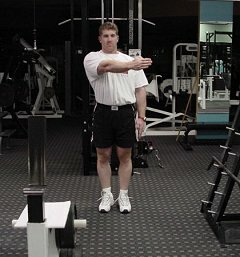 Raise your right elbow above your head and grasp it with your left hand, keeping your arm bent. Without bending your knees, lean to the left. 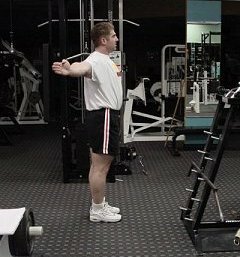 Lower Back: Pull your knees toward your chest. Simultaneously relax your lower back. Mid and lower back: Sit with your legs straight and your upper body almost vertical. 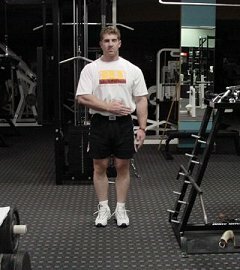 Place the back of your left elbow on the back of your left knee. Push your right knee to your left with your left elbow while turning your shoulders and head to the right as far as possible. 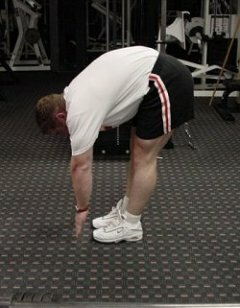 Hamstrings: Lie on the floor with one leg straight. Bend the other leg so the bottom of your foot is toward your knee. Slowly pull your chest toward your knee. 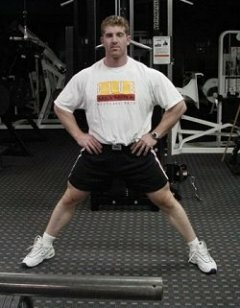 Quads and hip flexors: Kneel on the ground on one knee. Both knees should be bent at 90 degrees. Slowly lean and move your hips forward. Concentrate on keeping the bottom of your pelvis tilted forward.